Education authorities from around the globe explore deeper learning, a process that promotes higher-order thinking, reasoning, and problem solving to better educate students and prepare them for college and careers. Relying on research as well as their own experience, the authors show how to use intensive curriculum, instruction, assessment, and leadership practices to meet the needs of 21st century learners. Discover the vital importance of deeper learning to students future success. Effectively prepare teachers for deeper learning in the classroom. Successfully promote deeper learning with technology. Explore ways to foster students creativity, problem solving, and sense of entrepreneurship. Accurately and effectively assess for deeper learning. There is a lot of talk and activity around education transformation today. The vast majority, however, really consists of incremental improvements to traditional education: longer school days, more discipline, curriculum updates, social emotional learning, technologies like blended learning, etc. Those who pay attention to how society and the new global economy have changed know that today's demands on education can never be met with improvements--we must reinvent education from the ground up, really moving from schools to learning. That later work has come to be called Deeper Learning. From my experience, the group doing the most to explore reinvention is the Deeper Learning Network and related work of the Hewlett Foundation. In a sense they are going beyond what has been called 21st Century Learning or Skills to deal with the full range of academic and leadership skills demanded by today's economy. 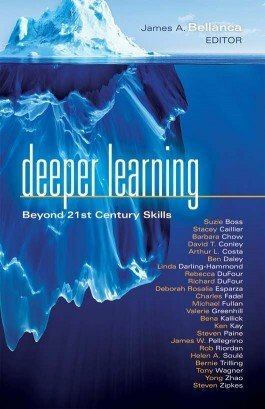 This book has contributions from members of that network and a variety of other thought leaders on deeper learning. Thus, it represents the most complete and up-to-date information I have found on deeper learning and where education needs to go. Frankly, that network is pretty broad, and some members are much further along from my perspective. This book has helpful contributions from the leading advocates (including Tony Wagner and Yong Zhao) and several of the most progressive implementers (including High Tech High - Riordan - and Manor New Tech High - Zipkes). There are also contributions from the perspectives of leading researchers, professional development groups and programs, helpful pedagogues, assessment, and policy. Extensive references are included with each chapter. I am recommending this book to anyone looking to catch up on the latest thinking and practice toward the future of education. Sure, a few contributions I find important are missing, but it is still a great compilation. Most educators and most citizens are still living within the past when it comes to education, which is very easy to do. People are happy with the education they got, and they tend to think the same education is good for their kids. This book could help open minds to some new perspectives. Somehow, we need to get education within our country moving in this direction. Hopefully, this book can help support more interest and understanding into that critical need.